This article submitted by Michael Jacobson on 3/22/00. Paynesville Area Elementary School might be the breeding ground for another Dr. Suess. At least, that's what the results of a recent essay contest inThe St. Cloud Timesseem to indicate. All the local fifth graders submitted an essay, modeled after the rhyming Dr. Suess story, "Sneetches." On Monday, March 13, the fifth grade winners were announced and their essays published inThe St. Cloud Times. Paynesville students took four out of the five places: second, third, and two honorable mentions. Nearly 200 students from central Minnesota submitted essays. 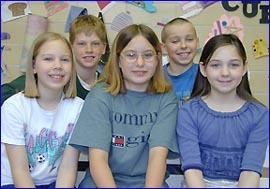 The winning fifth graders are: Emily Lindeman, Ben Moser, Kirsten Miller, Tom Lewis, and Nicole Domm. Fifth grade English teacher, Ms. Trish Skahan, surprised the local winners by calling them out into the hall, which had them thinking they had done something wrong, for a moment. "I thought, 'Oh, boy, I'm in trouble now. I probably didn't get my homework done,'" said Tom Lewis. "She said, 'You guys are winners,' when we got out in the hall," added Emily Lindeman. Lindeman, the daughter of Laura and Mark Lindeman, took second place, and Nicole Domm, the daughter of Denise and Robert Domm, was third. Lewis, the son of Becky and Mike Hubbell, and Kirsten Miller, the daughter of Amy and Steve Miller, earned honorable mention recognition. Miller, in turn, scared her parents by telling them Ms. Skahan had called them into the hall. Lewis said his parents brought a copy of the newspaper to work. Lindeman said her parents bought extra copies of the newspaper, and Domm said she sent a copy to her grandparents. Another surprise occurred on Monday, March 20, when the sixth grade winners were announced by theTimes. Among the winners was Ben Moser, who took second place despite being a fifth grader. Moser is the son of Roxy and Joe Moser. That gave the fifth grade five winners in the essay contest. Skahan said the fifth grade students develop a lot of writing skills through hard work and practice. "I was hopeful that someone would be published because it's such a thrill," she said. "We did a good job, we worked hard, and we were proud of our work." For the contest, students were asked to write an essay about groups overcoming their differences, using the rhyming style of Dr. Suess. Their essays are reprinted with permission fromThe St. Cloud Times. "It's not fair," said Sami in despair. Pammy can flip and all I can do is flop. Pammy flips with a twist and I bounce. She can flip with such ease like a flying trapeze. She can flip from the bars like a space ship from Mars. Her flips on the beam make the audience scream. Her flips on the vaults start with a power of steam; the landing is as light as a bowl of whipped cream. Her flips on the mat go this way and that. Now I, on the other hand, don't have a story so grand! I wobble on the bars like a wheel of a smashed up car. My attempt on the beam is quite a sight. I wibble and wobble, like thunder in the night. My vault is another matter. It causes much clatter. My landing on the mat is a loud "Kersplat!" I'll never be as good as Pammy in June, but I can sure carry a good tune! Each of us has a special gift to share. If we were all the same, it would be a great scare. So, it's OK that Pammy has a flip with a flair and I have a tune to fill the air. One day Ben and Sam, from the north side of town, were working on a car in the garage listening to the radio. The Channel 16 News was on. They were talking about the south side of town. They couldn't go to that side of town. The north couldn't go to the south side unless they had a red car with a star. So Ben and Sam tried to get to the south side. They thought if they painted a car red and added a star, no one would notice them. They met Cody and Elliott. They decided they wanted to be friends. So they convinced everyone that the town should be one. From that day on, everybody used both sides of town. "Amanda can dance and I cannot!" "I can dance," she said, "with a little trout." can surely dance in her great dancing shoes. "I wish I could dance," said Nicole with a Boo-Hoo! "I'm better than you," said Amanda with a tap of her shoe. "I do not care if I cannot dance, everyone's not the same-I do not have a chance!" "She can dance-I do not care-we are all equal and that's just fair!!" Once upon a time in a faraway land, the sky was so blue and the grass was so soft. In this land lived Narrows. Some were sharp as arrows but not all Narrows were as sharp as arrows. Some were dull like a ball. No not like a ball, a ball is not dull as what the other Narrows, as sharp as arrows, said In fact, they said the other Narrows are really dolls. One day a dishfish came and said, "I can make you as sharp as those Narrows, as sharp as arrows. So, he sharpened them as sharp as any sharp Narrows as sharp as arrows. Now, that we are as sharp as you, we can all be together. Fine, if you pass a test. Fine, you have to spell Dr. Seuss forward and backward. So they did. They got to be with them. Once upon a time in the land of Kare, just outside of Paynesville, there were two kinds of people: Blondes and Brunettes. The Blondes always thought they were better than the Brunettes. When the Blondes had parties every Friday night with singing, dancing, and tons of fun...they never invited the Brunettes. The Brunettes were always left out. One day, a young, red-headed lady named Prunella Smarty-Pants came along from "The Real World." She said to the lonely Brunettes, "Come into my hair dyer thing-a-ma-bobber and become a blonde. It only takes ten seconds!" So, of course, all the Brunettes jumped right n line to go into the hair dyer thing-a-ma-bobber. But once they discovered that it cost ten dollars, they all ran home as fast as their little legs could carry them, and each family grabbed $10 for every Brunette in the house-even the dogs! After all the Brunettes went through, they went over to the "real blondes" and said, "Look at us. We're blond, too!" This made the "real blondes" furious! Then Prunella went over to the "real blondes" and said, "Come into my hair dyer thing-a-ma-bobber and become a brunette for only $13." So the "real blondes" went home and got $13 and went into the hair dyer thing-a-ma-bobber. The blondes came out just in time to see the "real brunettes," getting back in line. They wanted to be just like the "real blondes"-even the dogs. So, the "real blondes" went home and got more money. Meanwhile, so did the "real brunettes." The blondes and the brunettes kept going through the hair dyer thing-a-ma-bobber so many times that all their hair fell out! The rich red-headed Prunella said, "Oops, I forgot to tell you that could happen." Since now they couldn't tell each other apart, they all became great friends. They all learned that hair color had nothing to do with what kind of person you are. Then, everyone started having fun at the Friday night parties, even the hairless dogs! By now, the whole town became such good friends, that at the edge of town they put up a sign that said: "Welcome to: Kindness always works here."